The Best Ceramic Charcoal Grills For Smoking, Baking, & …Grilling of Course! If you're ready to explore Kamado grills, start with the following list of the top 5 best ceramic charcoal grills. Variety and consistency are what stand out the most with the Char-Griller 06620 Ceramic Charcoal grill. This grill offers a total of 447-square inches in cooking space: 314-square inches of primary space and a warming rack consisting of roughly 133-square inches. What makes this ceramic grill special compared to a traditional charcoal grill is the insulated design. This exclusive design creates more heat using less charcoal; saving your fuel stash while cooking your meat to a perfect state. You can also choose from 4 colors – black, red, brown, or blue. Now you can match your cooking accessories or the porch in your backyard! 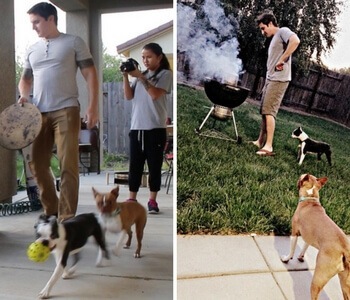 Cleaning up and moving the grill from one place to another is easy. The lid is secured by a metal latch that will keep all the ashes and other food particles inside the grill, rather than leaking from the unit and making a mess. The dump ash pan will help you clean much more efficiently as well; allowing you to dump the ashes to start fresh the next time you light up the grill. The Kamado Joe Classic II is an ideal ceramic charcoal grill. With the half rack design of the grill, the cooking space will almost double and give you the freedom to choose how close the food is to the heat source. The gasket is made with a double thick wire mesh fiberglass which provides an exceptional air-tight seal and an extended lifespan in comparison to the standard gaskets. Although a select few buyers have experienced slight paint chipping, the sturdy aluminum control tower top vent can easily control the airflow of the grill. It is also highly portable. On the bottom of the grill are four small wheels that will let you take the grill from point A to B without any effort. This is not a cheap grill, but you are paying for quality. Between the superior airflow system, the easy to read thermometer, and the two side shelves that provide extra preparation space, the Kamado Joe Classic II is one of your better options. With the Pit Boss ceramic grill, you can efficiently burn charcoal for a long-lasting cookout. This grill is made with a heavy ceramic material. Food preparation will be a breeze with the two solid bamboo side shelves. The shelves are very sturdy so placing a generous amount of food on there won’t be an issue and you can also fold the shelves down when you’re finished so you can store the grill quickly. The dual tier cooking grates provide plenty of space so that your food will be able to absorb the heat from the grill; helping your food cook faster. The grill is available in two sizes – 22-inch and 24-inch. With the cast-iron top tamper, you’ll have complete control of the airflow within the grill so that you can create the right temperature. Speaking of temperature, right under the air vent at the top of the lid sits the temperature gauge, which makes it much easier to read. 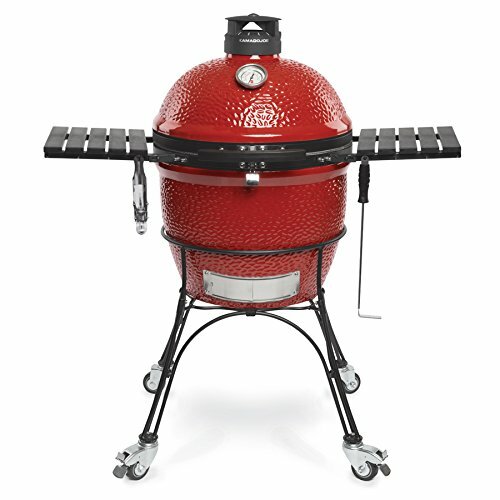 The Louisiana Grills Kamado ceramic grill is like the Pit Boss grill in appearance. It is offered in 22-inch and 24-inch sizes. The heavy ceramic body will keep in all the heat that comes from the burning charcoal. To prevent your meats from getting dried out, it’s important to keep a minimum amount of airflow within the grill. It has a stainless iron top tamper that is meant to give you complete control of the airflow, which will help you maintain the perfect temperature. The two wood side shelves are very strong and can fold when needed so that you can fit the grill in tight spots. The four medium-sized wheels on the bottom will also let you drag the grill where it needs to go without straining yourself. The air vent at the top of the lid is easy to use. This is great news because it is crucial to bring in a small amount of air to circulate the heat. The Primo 778 XL oval ceramic grill might not look like much at face value, but you will be surprised to know that it can cook your food quickly at higher temperatures. The unique oval shape helps it stand out from the crowd and gives you more options for grilling your meat. The exterior features a high-quality ceramic blend that is coated with a scratch-resistant, protective porcelain glaze. This will give you peace of mind to use this grill in any environment without being nervous that it will get damaged with scratch marks. You also get about 400-square inches of cooking surface, but that doesn’t mean you’ll be limited in space. With additional rack extensions, the cooking surface can reach up to 680-square inches! That’s a significant difference compared to the original cooking size. The biggest concern with this grill is the price. This grill is typically sold for over a thousand dollars and not everyone has the funds or wants to spend that amount of money in one spot. If you do decide to get this ceramic charcoal grill though, you will have a handful of ways to grill your food to perfection. Let’s talk about what you need to look for so that the grill you purchase fulfills your everyday needs and then some. The first thing to look for in a ceramic charcoal grill is the size. The size of your grill will ultimately determine how much food you will be able to cook at a time. Whether it’s in your backyard or for the family reunion at the park, you need ample space to cook your food. If you want to experiment with several types of cooking, such as the 2-zone cooking method, you should look for grills that easily allow additional racks to be connected to the ceramic unit. 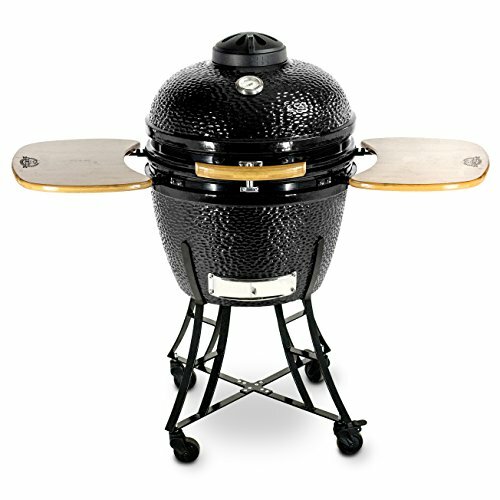 The Char-Griller 06620 Kamado charcoal grill and the Primo 778 XL offer reasonable space, with extra space available via a warming rack. Ceramic charcoal grills are essentially a specialized grill, therefore it’s not the easiest to find in your general department store. For those who are very meticulous about how your grill fits in with surrounding items, check out the design options of potential ceramic grills. The Char-Griller 06620 Kamado grill is available in 4 colors, so if you want your grill to match certain backyard accessories, this might be the grill for you. Cooking foods with a ceramic charcoal grill will establish an extremely hot temperature without the need of excessive fuel. One drawback to cooking with a ceramic charcoal grill is the challenge of controlling the temperature, but once you get the hang of it you will find grills like these to be an asset to your everyday cooking sessions. Based off old Japanese ovens, the ceramic charcoal grill, also known as the Kamado will serve you well if you consider size, where to buy the unit, and overall design. 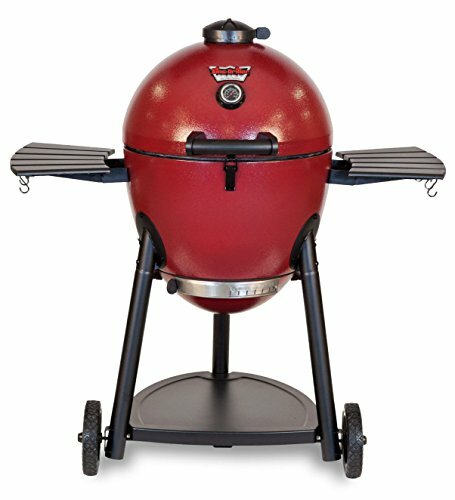 What is a ceramic charcoal grill? 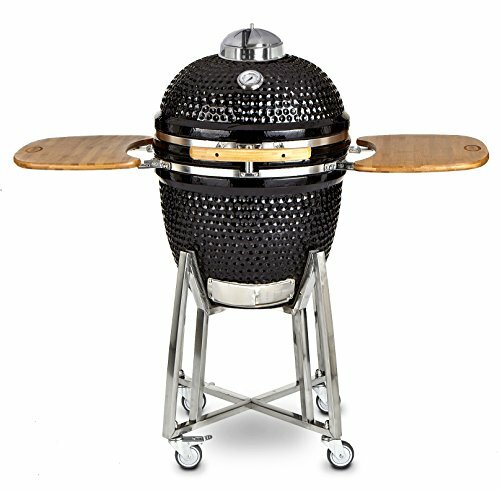 Ceramic charcoal grills feature the ancient design of the Japanese Kamado – a device with an oval shape that tends to resemble an over-sized egg. The overall concept of the ceramic charcoal grill is efficiency. Users can use a limited amount of charcoal and still produce an acceptable amount of heat for their food. Regardless of the weather outside, ceramic charcoal grills are built to last no matter where you’re cooking. The grill’s thick layers create unmatched insulation that can keep heat strictly within the grill. Starting it won’t be a hassle either since it doesn’t take much fuel or oxygen in the first place since they have so much insulation. Ceramic charcoal grills are also useful because they typically retain the meat’s original juices. In other words, you won’t have to worry about your meat being dried out all the time when using a ceramic charcoal grill. With regular grills, natural liquids from the cooked meat dries out once it gets too hot and becomes exposed to an excessive amount of airflow. Unlike most other grills, meats cooked on ceramic grills lose no more than 20% of water content from their original form. Based on the design of the grill, flare ups are almost non-existent. The cooking meat is typically raised much higher than it would be on a standard charcoal grill, so there are no realistic chances of grease falling onto the heat source and creating a large flame. While every ceramic grill is different, once you get the heat going, there is little effort needed from you until the food is finished cooking. After you’re finished, all you’ll have to do is close the dampers and let the charcoal air out on its own. For the most part, ceramic grills don’t need much maintenance to remain clean. You won’t have to scrub down the grill as the interior mostly takes care of itself. If you absolutely need to clean your ceramic grill, the best thing to do is scrape the food particles from the cooking grates and gently clean out the ashes. Versatility is one appealing factor of a ceramic charcoal grill. Most ceramic grill enthusiasts refer to the “2-zone cooking” method, which is essentially when one side of the grill is placed directly above the hot coals and the other side is cooked at a lower temperature because it is higher up and cooked from the fumes. Grills like the Primo 778 XL are perfect units for 2-zone cooking because of the round shape. Ultimately, ceramic charcoal grills are great to use when you want to cook outdoors year-round and put it in the least amount of effort. While the idea of a ceramic/Kamado grill might seem like an ancient practice, these grills do an exceptional job at raising heat to the highest levels using the least amount of charcoal possible. You are here: Home / Outdoor Cooking / The Best Ceramic Charcoal Grills For Smoking, Baking, & …Grilling of Course! That’s good to know that using a ceramic grill allows you to get a pretty good result without having to put in a lot of effort. My husband loves grilled food but he and I both work a lot so I’m trying to figure out something we can use that takes up less time to cook with. This seems like even if it takes up a lot of time that we won’t have to work too much to use the ceramic grill so even if we’re tired we can have good food so I’ll have to look more into it.